Protein Skimmers - Some skimmers are specifically designed to be operated in a sump. Live Rock - Many aquarists place a quantity of live rock in their sumps to add a lot of surface area to their biological filter for increased ammonia processing. Relatively inexpensive, highly porous base rock works very well for this. Another a good place to "seed" live rock to be placed in another saltwater aquarium for fast cycling. Wet/Dry Trickle Filters - Placed in the sump are out of sight while they do their jobs. Beneficial Macro Algae - aquacultured in sumps (add a simple light fixture on top of the sump) with a number of potential benefits including nitrate and phosphate reduction in the aquarium water as well as potential food for your tank critters. Mangroves - Add a light under the tank and mangrove plants will grow very well removing unwanted nitrates, phosphates and other toxins from the tank water. Mechanical Filters - Are the first filter when the tank water overflows into the sump. Aquarium Heaters - Placed in the sump instead of hanging in the aquarium are out of sight and not subject to accidental damage. 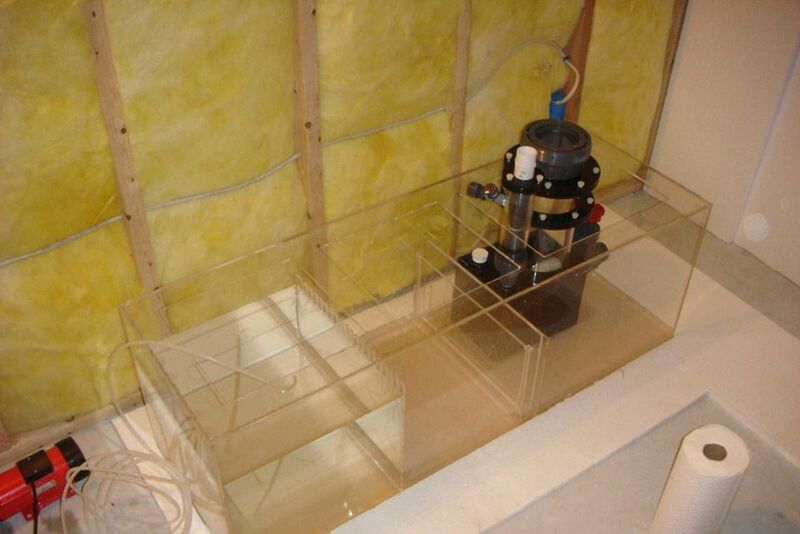 Automatic Top off System - float valves are easy to install in a sump. No more hauling top off water to your tank every few days. Available at most hardware and home improvement stores. Usually costs less than $15. Cut it down to fit under your tank. Great for locating remotely (in the basement or in another room). Usually costs less than $10. Available in most home improvement stores. Available in a number of sizes and shapes. Garage and yard sales are good sources for used aquariums that can be purchased for very little money. Make sure to perform a wet test to check for leaks before installing. An easy DIY project, DIY glass aquariums can be designed to fit under almost any aquarium for a surprisingly small amount of money in very little time. Why pay a small fortune for a commercially produced aquarium sump when an everyday household product will work just as well? Mini-Reef Tanks are particularly good candidates for DIY Sumps. A sump can dramatically increase the equipment you can utilize in your aquarium system as well as add water volume to your nano reef tank system.